Warm Greetings and love from Calvary Chapel Pakistan! We praise God for His love, care and blessings! We are always thankful to you for your prayers, love and support. We are really excited to share with you how God is demonstrating His power in the our lives and the lives of those we are reaching through His Holy Word. During our outreach in our surrounding, we meet different people on regular basis, we came across many Roman Catholic groups in the past, but we could not start Bible study or fellowship with them as their intentions of fellowship were material support in different forms rather than Bible study. Many Roman Catholic groups in the villages are abandoned as they are not being reached anymore and the reason can be that this particular church don’t have enough Catechists and even priests. The meeting with one particular group was really encouraging as we felt that they wanted to learn from the Word of God. Brother Joseph started studying “Gospel of Matthew” with them and this has been wonderful experience both for Joseph and this group. They all gather 4 days every week and study gospel of Matthew verses by verse. This week the number of participants was 40+ according to Joseph. Studying the word of God this way, with new perspective personally is first time experience in their whole life. We are so happy to see God working in the hearts and lives of people in such groups which would never allow protestant church to share the Word with them. We work hard in our office to make notes for these people and are prayerfully serving among these people. Please keep this new group in your special prayers! Audio Bibles: We have developed 5 groups of those people who cannot read or write, and have provided them Audio Bibles supplied by “Faith Comes by Hearing”. These groups gather regularly on different days of the week and listen to a chapter of Bible, discuss between themselves about the teaching found in that chapter and then pray for personal application. In the following short video, this group is listening to Matthew Chapter 6. Church Services: As we serve among mainly un-reached, these poor people feel much attraction towards prosperity gospel. While we share “Simply the Word Simply” for them to grow in the knowledge of God through Christ, we have witnessed the power of the Word in the lives of these people. Here is the short video of a group we reach and teach on Sunday Evening. These people work in the fields 7 days a week. They come back from fields late in the evening and then we have Sunday meeting with them. Though they are very tired because of the physical work, but many gather with their families to listen the word of God under the open sky on Sunday late Evenings. Our Newly formed groups that listen Audio Bible regularly to grow in Biblical understanding. Our congregations including brick makers that we are reaching with the Word. 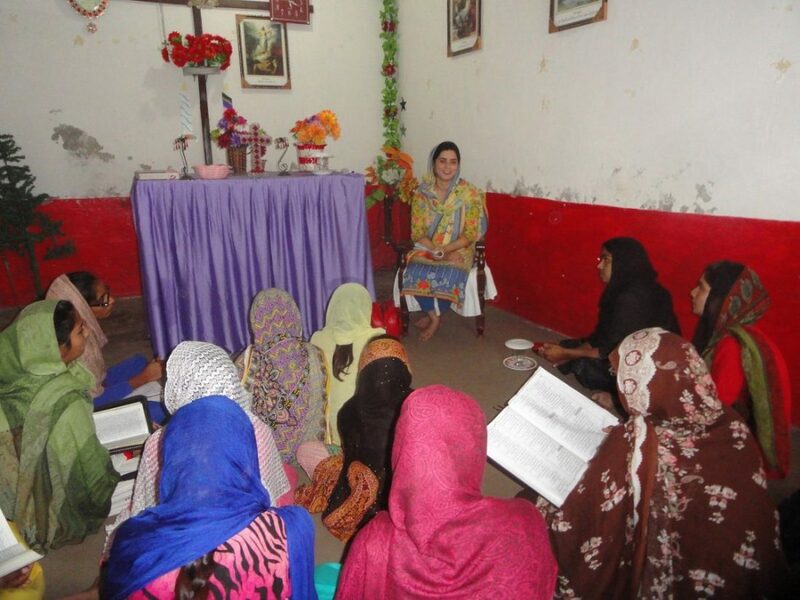 CC Pak Women Ministry that is taking the word of God to different groups in the remote villages. New Roman Catholic Group that brother Joseph is teaching to. Saturday Morning Youth Fellowship at a Christian High School. God Bless You and your family, We love you and pray for you!